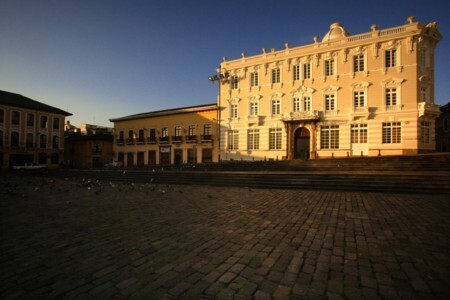 Casa Gangotena is situated in a restored historic mansion in Old Quito. The three-story Casa Gangotena resides in a choice spot on Plaza San Francisco, a cobbled square rich with history stretching back to the days of the Inca. This mansion was the residence for several presidents during the late nineteenth century. Rebuilt in 1926 following a fire, the building was designated a 'heritage property' soon after the capital was nominated as UNESCO's first World Heritage Site city in 1978. Beautifully and eclectically appointed, the hotel's newly restored interiors draw the eye with Art Nouveau and contemporary touches combined with original Neo-Classical architecture. Extensive efforts have been made to preserve and restore the mansion's original details, assuring an air of history and sophistication dressed up with understated luxury. Each of the 31 suites is thoughtfully arrayed for utmost comfort beneath towering ceilings, with king-size beds occupying 13 rooms and twin beds in the other 18. Glorious Andean light pours through tall windows, with views of the historic square, the inner courtyard or the Panecillo hillside. Two suites on the second floor can be interconnected to provide expansive accommodation for families. Full luxury amenities are standard. A broad terrace on the third floor offers the best seats in the house for everyday life in Quito. From there magical views of the square, the bell towers and spires of Old Town can be seen. The hotel's cozy glass-roofed patio is perfect for relaxing with a patio-garden planted with orchids, flowers and ornamentals just beyond. On the ground floor, the dining room is decorated in harmony with the rest of the property, presenting a wonderful setting. The cuisine is a modern international take on traditional Andean and coastal ingredients, prepared with verve and passion by the hotel's experienced kitchen staff. The wine list features handpicked vintages, particularly from Chile and Argentina. A room service menu is also available around the clock.